Creating a niche of EOT Crane such as Double Girder EOT Crane and Single Girder EOT Crane at its best, with utmost quality. With the aid of our hardworking professionals, we have been able to come up with a range of Jib Crane. 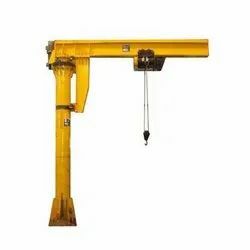 We are instrumental in providing extensive range of Jib Crane which are highly reliable and efficient in operations. Developed after extensive research, these are highly acknowledged for their outstanding attributes, such as smooth, easy rotation and longer service life. Looking for Jib Crane ?